The cervical plexus is a plexus of the anterior rami of the first four cervical spinal nerves which arise from C1 to C4 cervical segment in the neck. They are located laterally to the transverse processes between prevertebral muscles from the medial side and vertebral (m. scalenus, m. levator scapulae, m. splenius cervicis) from lateral side. There is anastomosis with accessory nerve, hypoglossal nerve and sympathetic trunk. 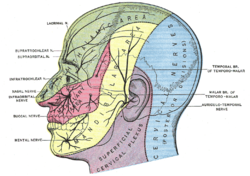 The cervical plexus has two types of branches: cutaneous and muscular. Plan of the cervical plexus. ^ Robert Schwartzman (15 April 2008). Neurologic Examination. John Wiley & Sons. p. 58. ISBN 978-1-4051-7283-7. ^ a b R.J. Schwartzman (31 July 2006). Differential Diagnosis in Neurology. IOS Press. pp. 326–. ISBN 978-1-60750-179-4. Anatomy figure: 25:03-02 at Human Anatomy Online, SUNY Downstate Medical Center - "Diagram of the cervical plexus"